Saturday was one of those days where you just didn’t know who was going to stop by. Walking by our bedroom window, I glanced out and saw this. I recognized that character on the left as an egret, but what in the world was that huge creature on the right? It’s amazing that the marsh grass could support his weight. Camera in hand, I headed out the door. That scared him away, but he circled and attempted to land again. 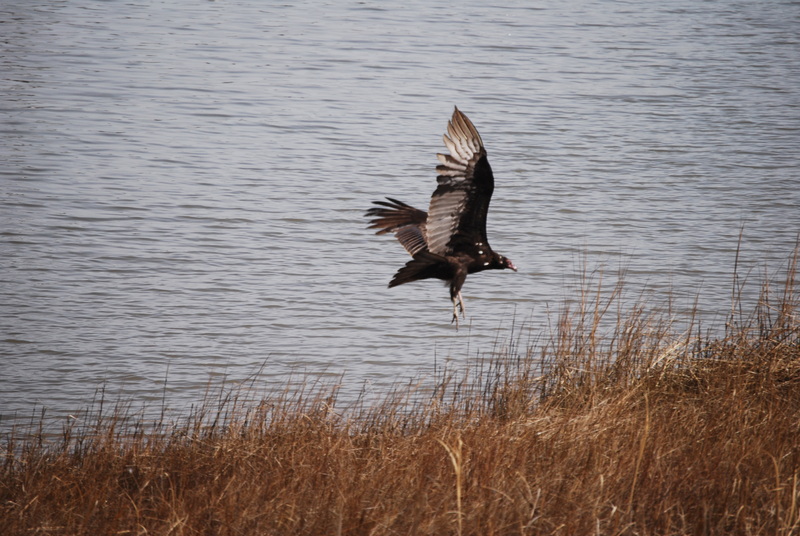 As much as I had hoped it was an eagle, I think it was a vulture. 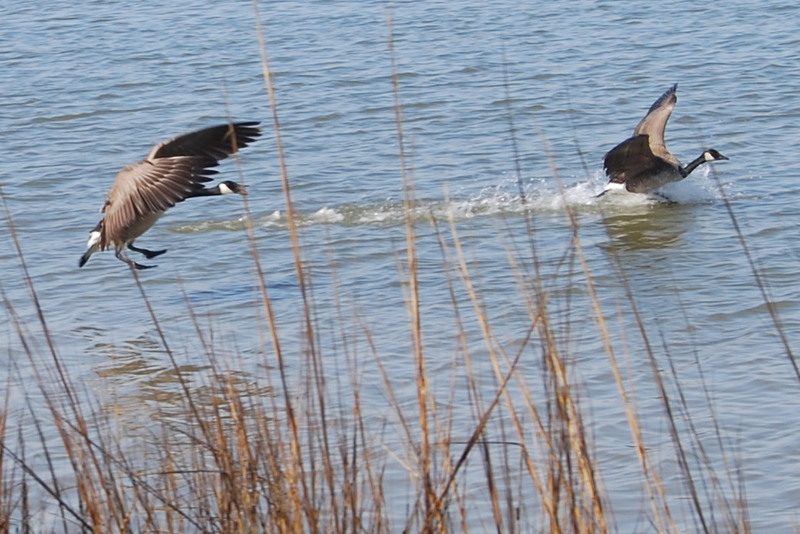 Then these two Canadian geese flew in. I think the one on the left is practicing sliding into home plate. And two more. Motor Man and I are in disagreement about these two. I say they’ll be competing in synchronized skiing at the Olympics. Motor Man says they’re drag racing. We’re not sure. 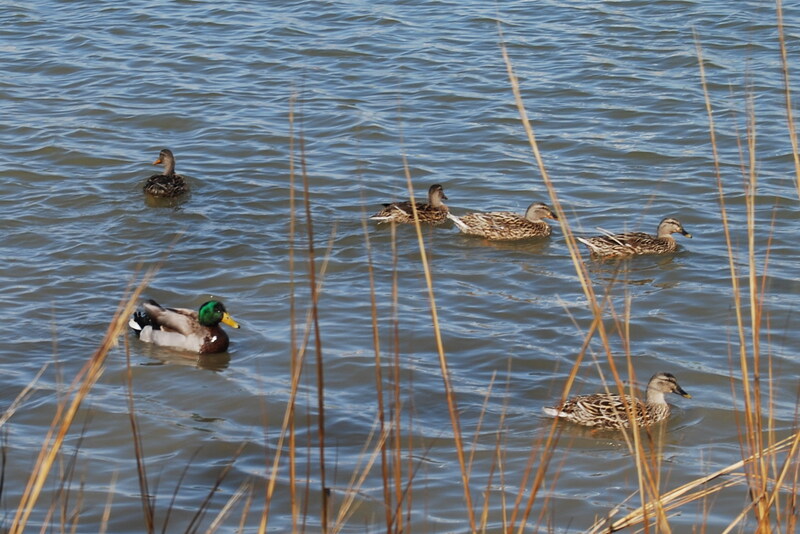 And last, but not least, a family of ducks came by, searching for any bread crumbs that Groom Swan may have missed. It was definitely a day to keep an eye on the water. 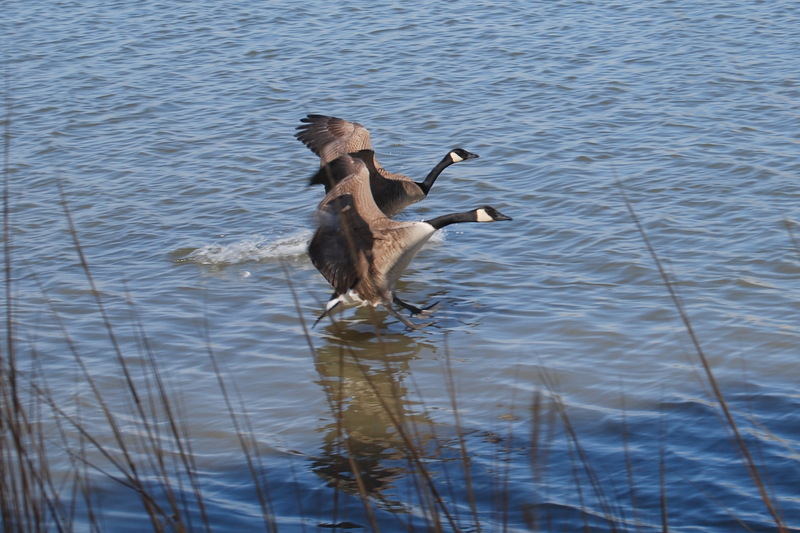 This entry was posted in Days at Home and tagged Canadian geese, ducks, egret, swan. Bookmark the permalink. I don’t think that’s a vulture…I think it’s a hawk…the shape of the head and beak doesn’t really look like a vulture. Of course, you saw it “in person”. It almost got crowded at your house!! Just don’t let them in your yard. What a mess that would be! Ha! I know I’ve said it before, but it really is Wild Kingdom around there!!! You never do know who’s gonna’ show..! Nah, I agree with you – vulture. What a great place you have!!! Love all of it! I agree with you that the last two are synchronized…but I thought swimming. But your skiing just might be better. 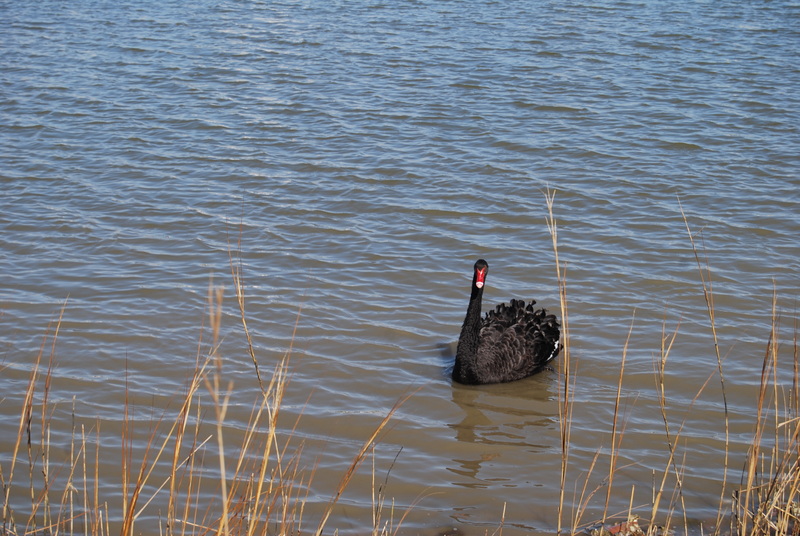 I love the black swan. 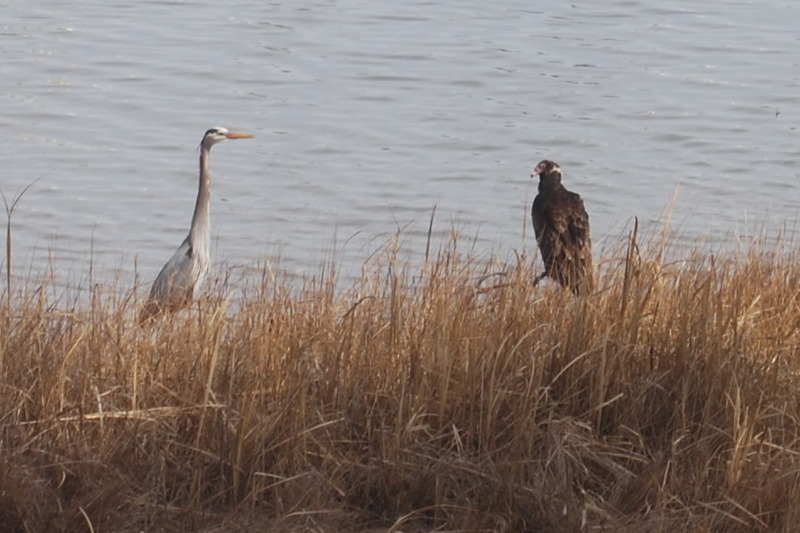 Kind of amazing to capture a blue heron and a vulture in the same shot….I think I need to visit your world. Hey I stumbled upon your website by mistake when i searched AOL for this subject, I have to say your page is actually valuable I also like the theme, it is wonderful!